My goal with this new body of work is to transcend labels and elicit a visceral response in the viewer. Scott Grimando is a multi-media artist blurring the lines between Fine Art and Pop Surrealism. As an illustrator, photographer and advertising professional his new series of figurative based symbolism bridges the gap between his many disciplines. As a teenager he studied under Harold Stevenson, one of the few protégés of Norman Rockwell. 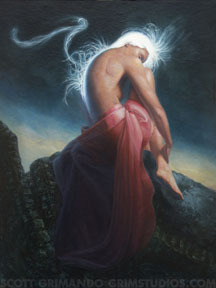 Today he is a widely collected mystical realists painter as well as a renowned digital illustrator. His imagery has graced the covers of dozens of books and magazines, blazing a path of innovation in the publishing industry over the past fifteen years. 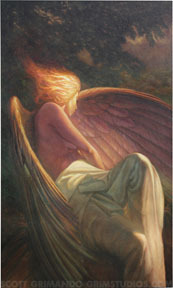 Much of his recent symbolist work is about modern pressures and frustrations. The theme is a feeling of being mechanized and overwhelmed by technology. The beauty of the human form is consumed by textures like metal, rust or stone. The images are about breaking free, finding hope and maintaining our humanity. 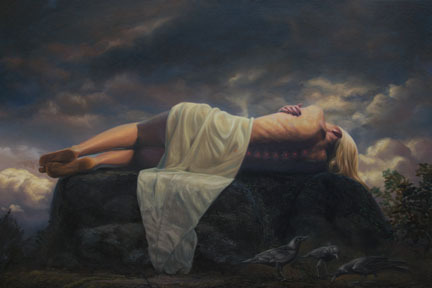 Scott’s work tells a story on a deep emotional level sparking something deep and reverberating. It grabs the viewer forcing them to think about the meaning of the image. All images © Scott Grimando & are not to reproduced in any form, digital or otherwise without permission of the artist.